I did a "solo" crawl this time. 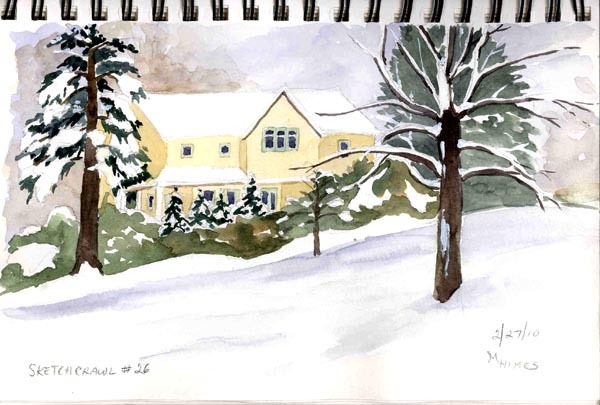 My area of New Jersey got a ton of snow in the last two days, and I sketched it today from the warmth and comfort of my home. 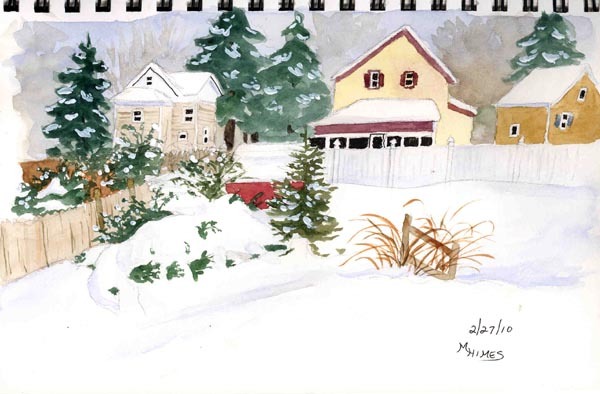 I only completed two sketches - one from the front window looking at the house across the street, and one from the back window looking at my backyard and the homes of some of my neighbors. I used my usual outdoor sketching kit - my small cotman kit, an pencil and a waterbrush. Very beautiful scenery. I love snow view because our place doesn't have much snow. But it looks so cold. Good to hear you were in your home. Thank you for commenting on my sketches, Maki, Karynz, and HedgeWytch. Yes, it was cold, which made sketching from my windows more appealing than going outside. Michelle, wonderful snow SketchCrawl. That will never happen in Thailand. I love the colorful houses against the white snow with awesome trees and vegetation. Thank you, Ai. It was pretty while it was coming down, but it's hardly convenient for sketchcrawling, running errands, or for those who have to go to work. Mickey - Great job on the snow paintings!!! I love the one of the house across the street, but the one of the backyard view really came out good too. Sorry we couldn't get to sketchcrawl together, but I think you did very well without me! Thanks, Joan. I've been thinking that the house across the street would make a good snow painting. I missed sketching with you. Hoping for better weather next time so we can go out to sketch. what a beautiful place you live in! Well done for capturing it so well. I can feel the cold from Hong Kong! Thank you, Rozkeep and Enrico. Well, my beautiful wintery landscape has warmed up, gotten rained on, and melted. There is still snow left, but doesn't look nearly as pretty anymore. I should be ready for outdoor sketching for the next one. Woooow!! Really beautiful! What a lovely place you live and what serene and gorgeous mood! Love them so much.